I woke this morning to a text from an old friend that Soundgarden frontman Chris Cornell had died. A short while later I saw another friend had tagged me in a post on Facebook: it occurred after Soundgarden’s apparently triumphant return to Detroit last night, and the early speculation is suicide. He was 52. 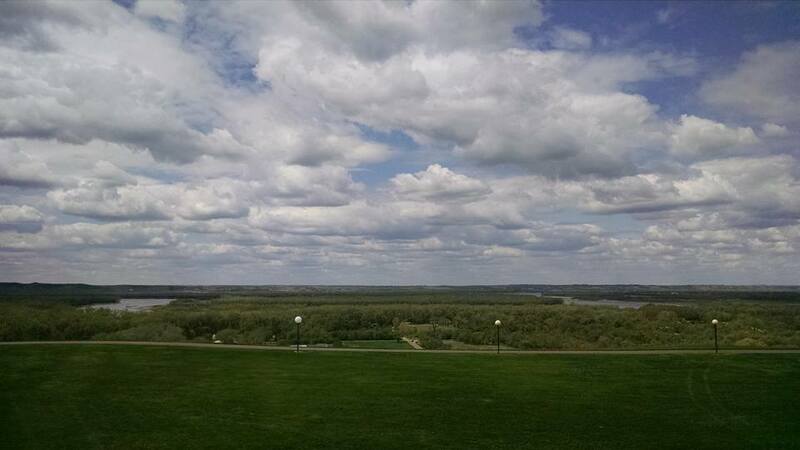 As we crossed the plains of North Dakota this weekend, I made a surprising discovery: my college roommate Frank is now the Honorable Franklin R. Parker, assistant secretary of the Navy. I pulled out my phone, entered “franklin r parker,” and voila: “President Obama Announces More Key Administration Posts.” To be sure this was, in fact, Frankie Parker of Durfee Hall D-21, I dug deeper and found his official bio page on the U.S. Navy’s website. That’s him. That’s guy I roomed with freshman and sophomore year, whose parents took us to see Ray Charles perform in New Haven, who stood up as a groomsman in our wedding at tiny St. Liborius Catholic Church in Polo, South Dakota, and whose own wedding was a Chicagoland mashup of African-American and Asian influences with a little Cherokee thrown in. If I’m honest, a small part of me was, not jealous, but curious if I could have been something more. As evidenced by his resumé, Frank is a smart fellow, and he’s always been better at making connections than I am — but I did well in college and well in every job I’ve had since. What is it that separates two men with an Ivy league education and a liberal arts degree, such that one goes on to graduate school, prestige, and power, and the other works retail, starts a family, and lands at his local church as faith formation director? Ever have that happen? It’s not envy — I don’t begrudge him his success or even want what he has. It’s more like a form of pride or vanity, wondering if I could have been more than I am. Ultimately I remembered something I wrote during freshman year at Yale: I came East for an education. It was never about a career for me, and I never planned to stay there. I came to learn all I could at one of the great old universities our country has to offer. And I did. Brendan is a smart young man. He can do almost anything he sets his mind to, and for years his goal was the Naval Academy and the Marine Corps, until he began to grow deeper in his Catholic faith and realized he wasn’t sure he could trust our country’s leadership to deploy him to only just wars. Then his focus was engineering, until he began to think specifically about what he liked (understanding how things work and making stuff, like his Dziadzi) and what he didn’t like (lots of math, computer work, and CAD, like a professional engineer). He’s always loved history and enjoyed theology and literature — so he began thinking about studying, teaching, and writing about the things that he loves. I can’t fault him for that. 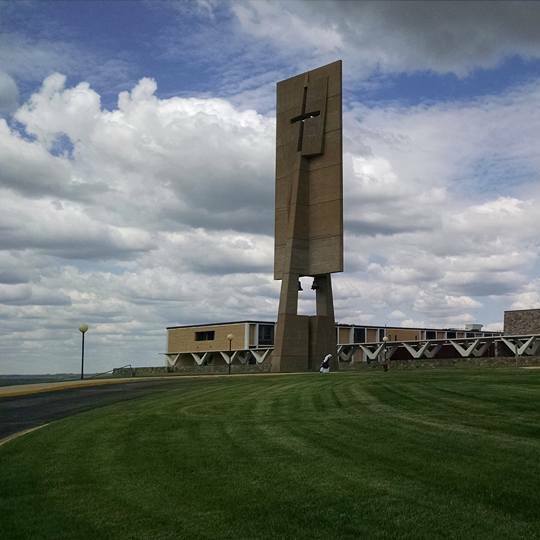 We spent the night in the Expressway Inn in Bismarck (nicer and quieter than it sounds) and the next morning, headed out of town and up the hill to the University of Mary for Mass and registration activities. I hadn’t visited yet, and though I knew it was small, I hadn’t imagined what small might look like in this case. My last higher-education employer, the University of Minnesota, has about 51,000 students; my previous higher-ed employer, Ferris State University, boasts 14,500, and Yale has around 12,000, with a bit more than 5,000 undergraduates. 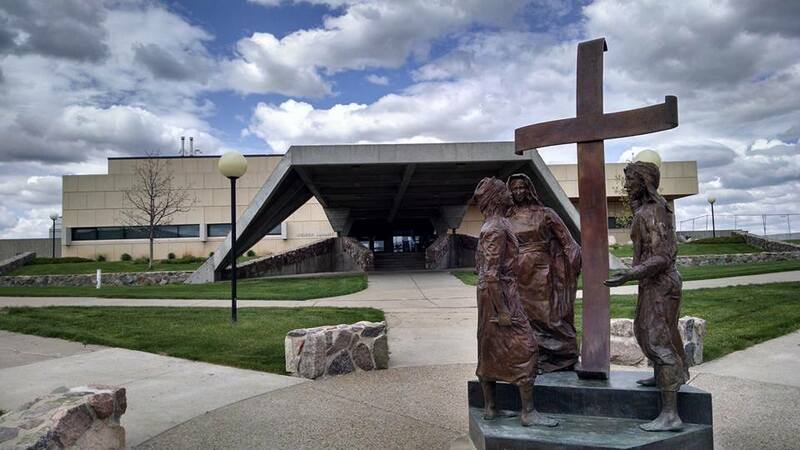 UMary, by contrast, has a total enrollment of just 3,000 — a tiny cluster of stone and concrete buildings hunkered on the edge of a high bluff overlooking the Missouri River. The buildings aren’t beautiful in any conventional sense; built in the middle of the last century for the wear and tear of young people and the wind and weather of the plains, they are low, solid structures with the quiet strength of stones unmoved by the world and its ceaseless spinning. We started our day in a tiny chapel, well lit and peaceful, with a handful of prospective students and their families, current students, and administrators. We were first to arrive just behind the priest, a gray-haired Benedictine, and prayed in silence until Mass began. It being the feast of St. Mathias, the readings were focused on the selection of Mathias to replace Judas among the Apostles and Jesus’ command to love one another. In his homily, Fr. Anthony contrasted our current presidential election process with the prayerful selection of St. Mathias, and contrasted the fame and power of our political leaders with the relative anonymity of St. Mathias both before and after his selection: basically the only things we know for sure are that he was with the other apostles in following Jesus from the beginning through the Resurrection and that he died while sharing the faith with an unbelieving world. He does not appear to have been self-seeking, but to have had one desire: to “to go and bear fruit that will remain” and to lay down his life. I have reflected on his homily numerous times since, and while I don’t fault Frank for working hard to be where he is in his life, I am no longer curious where else I could be. After Mass I told Brendan and Jodi I had a tremendous sense of peace about UMary. “This is a good place,” I said. The original school was founded by Benedictine nuns at what was, at the time, the end of the railroad tracks headed West. During the opening session of the day, the current religious sisters who live in the monastery at the edge of the campus came to pray over the incoming students and their families. They ended their prayers with a beautifully harmonized sung blessing, and we were separated into smaller groups from the rest of the day. Brendan was assigned an upperclassman to his liking: a triple-major in history, Catholic studies, and secondary education; the drummer in a rock band who was studying Polish in hopes of doing graduate work in Poland. 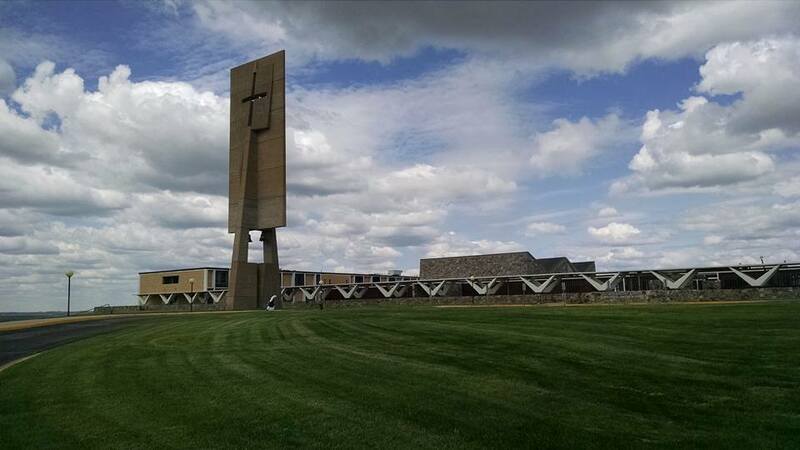 Jodi and I talked with various campus representatives, including an administrator in Admissions who said our parish’s reputation precedes us and asked what we thought it was that makes St. Michael a special place. We also wandered the campus, talking and taking a few photos, and I ended the day with a sense of great joy: I believe Brendan is where he belongs. It is true, practically speaking, that students should enter college with some sort of plan for what they want to do with a degree — otherwise the time and money are potentially wasted. But I believe it is also true that, for good students, a structured approach to the liberal arts can help create flexible, resilient young men and women who are prepared to lead, to sacrifice, and to preserve our culture in the days to come. I believe, in choosing UMary, Brendan has chosen a higher education (higher even than Yale in the ways that count most), and I’m proud and excited to see where this path leads. Somewhere along the line these past few years I picked up an English translation of the short novel Holy Week by Polish author Jerzy Andrzejewski. I bought it knowing almost nothing about the book or the author, because I used to study Polish in college, as a tribute to my maternal roots, and because Polish literature can be hard to come by. Andrzejewski is perhaps best know for his novel Ashes and Diamonds, which was turned into a well-known Polish film of the same name by Andrzej Wajda, who has also made a film version of Holy Week. I saw the movie version of Ashes and Diamonds in college and liked it, so I took a chance on the book. The novel tells the story on the Warsaw Ghetto Uprising and the tragic burning of the ghetto and elimination of Warsaw’s Jews during the days leading up to Easter of 1943 — from the perspective of a handful of Poles whose lives are variously entangled with each other’s and with a young Jewish woman trying to evade the Nazis and their Polish informers. It has stood on my shelf for a at least two Holy Weeks now, until this past Tuesday, when I took it up on a whim. It is a short novel — just 125 pages — with four chapters covering each day from Tuesday to Good Friday. I took this as a sign and read it a chapter a day, finishing the book’s final chapter this morning. Well-to-do landlord Zamojski, who at least avoids aiding the the anti-Semites, but who may himself be concealing his Jewish heritage. 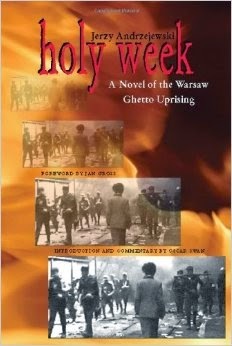 The juxtaposition of Irena’s struggle to survive and the ever-present cloud of smoke and sounds of gunfire and explosions from the ghetto against the backdrop of Polish Christians enjoying spring and preparing for the Easter holiday as best they can lends the novel an almost surreal atmosphere. The story was written and published quickly and courageously in 1945, and was not popular among Poles, whose nerves were too raw and wounds were too fresh, and who found the various expressions of racism and nationalism rang uncomfortably true. Even today, this book pricks the conscience, making the reader reevaluate how he or she perceives others and wishes to be perceived — and what circumstances might limit their charity on behalf of a neighbor who is unlike themselves. The book reads like an English translation from the original Polish — certain expressions do not ring true to American ears, but make sense in the Polish context — and the story will end too abruptly (and without sufficient resolution) for some tastes. Still, it is a quick and thought-provoking read. If you are interested, it is available through the Great River Regional Library in St. Michael, or you can borrow my copy. Twice in the past week I have forced myself to not write. This has been much to my discomfort, for two reasons: first, because a full 97 percent of the time, I am in the mode of forcing myself to write, which makes not doing so when I actually desire to quite irritating — like an itch you can’t scratch — and second, because in both cases the topic was near to my faith and dear to my heart. In the first instance, I had just finished a thought-provoking novel and wanted desperately to blog about it. 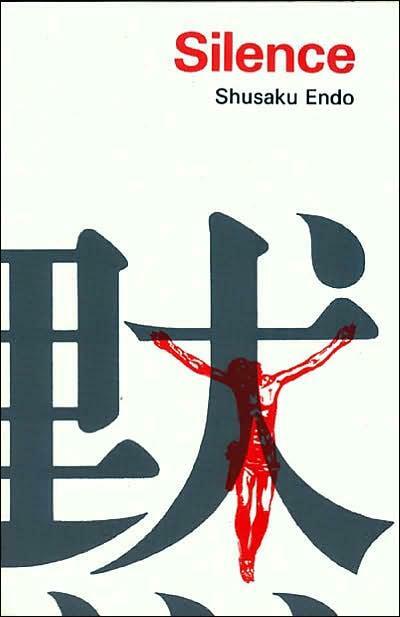 The book, Shusako Endo’s Silence, was cautiously recommended to me by my friend Fr. Tyler as a great book, but dark and terribly sad. He was right, and as I finished, I wanted immediately to engage someone — anyone other than myself — on what it all meant. The book is a relatively brief account of a Portuguese priest who travels secretly to feudal Japan during a time of intense persecution of Christians to discover the truth of rumors that his mentor, another Catholic priest-turned-missionary, has apostatized, or renounced, his faith and vocation. In broad terms, it deals primarily with the younger priest’s own thoughts about his priestly vocation, the poor Christians around him, the very real possibility of capture and torture, dreams of a glorious martyrdom, the brutal reality around him, and his own weaknesses. I’m being purposefully vague. The final chapters cannot be revealed without diminishing the power of the book and straying into areas of faith of which I am ignorant, so I will go no further at this point. Suffice it to say, these final chapters are what threw me into a tailspin — what made want to talk first and think later, and what made it impossible for me to do so in good conscience. Ordinarily, I write quick, from-the-gut reviews shortly after completing a book, while it’s still fresh. But in this case, there was simply nothing I could say about the book that would not a) show my own ignorance and potentially stumble into error about our Catholic faith, or worse, drive someone else to error; b) spoil the story in order to get answers (Fr. Tyler!) and peace of mind; or c) both. My caution in neither recommending nor casually reviewing this book, it appears, was not ill founded. The second instance of holding my proverbial tongue came this morning, when I noticed a blogger for the Chronicle of Higher Education holding forth on the Natural Law and the Catholic Church’s stance on contraception. (The blogger in question is not supportive, surprise, surprise.) As I read his post, I felt the blood rise in my cheeks, and my mind raised ahead, formulating the response I would write: witty, pointed, deftly picking at the holes I saw in his arguments until they were gaping and obvious even to his likeminded readers. My first reality check was the sheer volume of work I had to do today; I simply didn’t have time — especially to engage someone I didn’t know, personally or professionally, in an environment that was likely to be full of hostiles who were unlikely to be persuaded by wit or wisdom (let alone my own writing). I felt a momentary pang of guilt for not standing up and being heard, until I finished the piece and reflected on my formal knowledge of the Natural Law and Aquinas’s writings (relatively little). I don’t know what the blogger knows — I feel like his expertise is not deep — but going off half-cocked might leave my own weaknesses exposed, even to someone who’s knowledge is only slight deeper than my own. A poorly formed effort would make this “Defender of the Faith” a liability, easily dismantled and dismissed — and the Church, by association. “This is the emblem of [boys’] minds; at first they have no principles laid down within them as a foundation for the intellect to build upon; they have no discriminating convictions, and no grasp of consequences. And therefore they talk at random, if they talk much, and cannot help being flippant, or what is emphatically called ‘young.’ They are mere dazzled by phenomena, instead of perceiving things as they are. 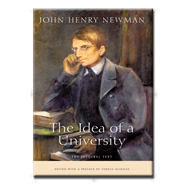 Cardinal Newman’s words resonated with me as I re-read them this morning. Starting from fixed points and making your ground good as you go enables you to keep your feet even as the world spins around you. This is why, in both instances this week, I hesitated – I was (wisely, I think) looking to the placement of my feet. Indeed. When was the last time you heard anyone in a suit answer a question with a simple I don’t know? Today, everyone’s got an opinion. We know too much, perhaps – and we often think we know more than we do. We think we know better – especially, better than those “ignorant” souls who came before us. Poor saps. Poor Cardinal Newman. At Yale I learned to argue, among other things, and not always in an honest manner. Unfortunately, strength of conviction and principle often seem less valued than compromise or an ill-defined “progress.” Partly in concession, partly to defend my views, which in college were considered quaint and outdated, I learned to bait-and-switch. I learned to massage my meanings as I went. And when I’m angry or impatient, I still do these things today.